Many people around the world have enough missing teeth to require the use of a denture. One of the main problems which occurs when using a denture is keeping the denture secure, particularly in the lower jaw. If you are one of the people who have this problem you already know about the discomfort and frustration of dentures which do not stay in place, not being able to enjoy the foods that you love and the ineffectiveness of denture adhesives. 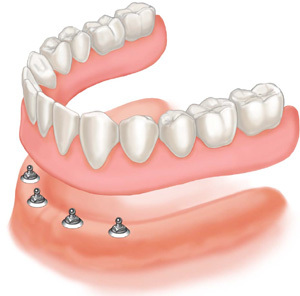 However now there is now a way to stabilise your denture with the use of dental implants. The use of dental implants to stabilize dentures has proven to be very successful and is an increasingly popular treatment.